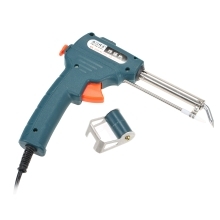 Soldering gun used compact mechanical design work easier. Tin wire scaffold can be disassembled, easy to use. Rated with a diameter of 0.8 ~ 2.3mm tin line. It will be a great helper for you. Soldering gun used compact mechanical design work easier. Simple, easy to complete the welding operation. Rated with a diameter of 0.8 ~ 2.3mm tin line. 1. Hand gun used for the first time, be warm a few minutes, a smoke is a normal phenomenon, will disappear in a few seconds. 2. Will be rated into the tin from the tin line into the mouth, and then pull the trigger direction of the arrow until the tin lead solder wire to the nozzle only to be working. 3. Stop the use or replacement of tin wire to be out, as long as the direction of the board-up drive, and remove the tin wire. 4. Heater replacement, the first protective cover removed, open the heater connection, and then remove the iron Tsui to the core of the heat can be replaced. 1. At work, iron and iron pipe temperatures up to 400 degrees Celsius, please do not touch. 2. Stop using the hand gun, set it on its bracket. 3. Work is completed, turn off the power so to save the place after cooling.